A widget that renders (XHTML) text. The text is provided through a WString, which may either hold a literal text, or a key to localized text which is looked up in locale dependent XML files (see WString::tr()). tag without closing tag) will thus be shown literally, since the HTML markup will be escaped. Wt does this as a safety measure, since it cannot reliably run the XSS filter without parsing the XML successfully. The Wt::PlainText format will display the text literally (escaping any HTML special characters). In some situations, Wt::XHTMLUnsafeText may be useful to explicitly allow scripting content. Like XHTMLText, it allows XHTML markup, but it also allows potentially dangerous tags and attributes. Use this if you're sure that a user cannot interfere with the text set, and XHTMLText is too limiting. WText is by default inline, unless the XHTML contents starts with an element such as <div>, <h> or <p> that is displayed as a block, in which case the widget will also display as a block. 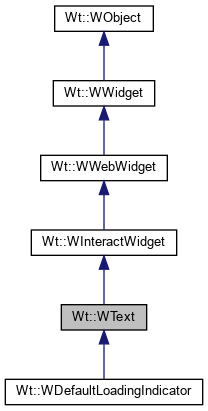 The widget corresponds to an HTML <span> tag or an HTML <div> depending on whether the widget is inline. Creates a text widget with given text. The textFormat is set to Wt::XHTMLText, unless the text is literal (not created using WString::tr()) and it could not be parsed as valid XML. In that case the textFormat is set to Wt::PlainText. Therefore, if you wish to use Wt::XHTMLText, but cannot be sure about text being valid XML, you should verify that the textFormat() is Wt::XHTMLText after construction. The XML parser will silently discard malicious tags and attributes for literal Wt::XHTMLText text. Creates a text widget with given text and format. If textFormat is Wt::XHTMLText and text is not literal (not created using WString::tr()), then if the text could not be parsed as valid XML, the textFormat is changed to Wt::PlainText. Returns whether internal paths are encoded. Returns the padding set for the widget. Enables internal path encoding of anchors in the XHTML text. Anchors to internal paths are represented differently depending on the session implementation (plain HTML, Ajax or HTML5 history). By enabling this option, anchors which reference an internal path (by referring a URL of the form href="#/..."), are re-encoded to link to the internal path. When using Wt::XHTMLText (or Wt::XHTMLUnsafeText) formatted text, the text is pasted verbatim in the browser (with the exception of XSS filtering if applicable). With this option, however, the XHTML text may be transformed at the cost of an additional XML parsing step. Sets padding inside the widget. Setting padding has the effect of adding distance between the widget children and the border, for a WText padding is only supported on the left and/or right. When the current format is Wt::XHTMLText, and text is literal (not created using WString::tr()), it is parsed using an XML parser which discards malicious tags and attributes silently. When the parser encounters an XML parse error, the textFormat is changed to Wt::PlainText. Returns whether the text could be set using the current textFormat. A return value of false indicates that the textFormat was changed in order to be able to accept the new text. Specifies how text is aligned. Only the horizontal alignment can be specified. Note that there is no way to specify vertical alignment. You can put the text in a layout with vertical alignment options though, or (misuse) the line-height CSS property for single line texts. The textFormat controls how the string should be interpreted: either as plain text, which is displayed literally, or as XHTML-markup. When changing the textFormat to Wt::XHTMLText, and the current text is literal (not created using WString::tr()), the current text is parsed using an XML parser which discards malicious tags and attributes silently. When the parser encounters an XML parse error, the textFormat is left unchanged, and this method returns false. Returns whether the textFormat could be set for the current text. The default format is Wt::XHTMLText. When wordWrap is true, the widget may break lines, creating a multi-line text. When wordWrap is false, the text will displayed on a single line, unless the text contains end-of-lines (for Wt::PlainText) or <br /> tags or other block-level tags (for Wt::XHTMLText). When a literal XHTMLFormatted text was set, this may differ from the text that was set since malicious tags/attributes may have been stripped. Returns the alignment of children.